Lamb shanks with sumac, mint & date stuffing – gorgeous! Hind shanks are bigger and meatier than small shanks. Small eaters will find a hind shank too much. Usually, 4 hind shanks with accompanying vegetables can be stretched to serve 6. If you can, cook shanks the day before serving so you can skim fat from the top of the juices before reheating them. If including peas, add them when you reheat the shanks. 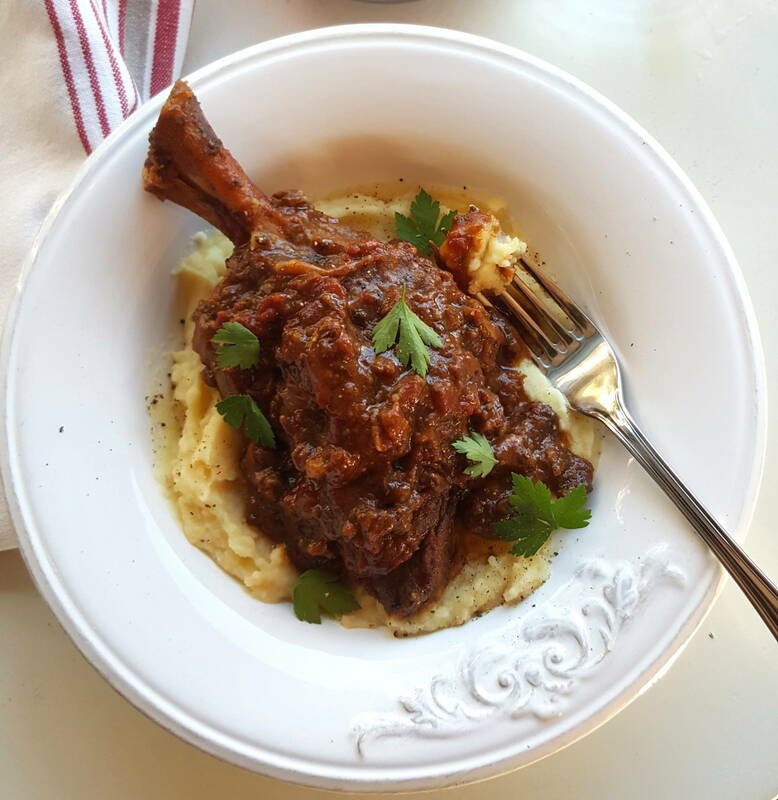 1 Bring lamb shanks to room temperature and preheat slow cooker on high for about 20 minutes. Lightly oil the inside of the slow cooker bowl. 2 Put everything for the date and herb paste in the bowl of a food processor and blend to a sticky but still lumpy-ish paste. Trim any loose fat from lamb shanks, then make 4-5 deep incisions in each. Stuff in some of the date paste. Form pockets in the shanks by slipping the fingers between any gaps in the meat and stuff in the remaining paste. Mix flour, sumac and salt and rub into shanks. 3 Put tomatoes, red wine and water in slow cooker and stir. Add lamb shanks, positioning bones uppermost where possible. Grind over plenty of black pepper and add any loose flour and sumac. Cover with a lid and cook on High for 4 hours. 4 If including peas, put them in a sieve and rinse under running hot water until they feel warm. Add peas to slow cooker and cook for 20 minutes more, until they are piping hot. 5 To serve, sprinkle lamb shanks with parsley and accompany with a bowl of couscous, rice or burghul, or a mash of your choice Potato & celeriac mash.